Submersible pumps with shredder are suitable for the treatment of water in both domestic and industrial use. The submersible electropums are used for pumping wastewater with fibrous solids and fibers, they can grind them into tiny fragments, allowing the passage also through small diameter pipes. The plumbing of each of these submersible pumps is designed to work at high heads with low flow rates, the shredder of the pump is built with special hardened steel for maximum cutting efficiency and maximum reliability. The electropumps are available with support feet for a transportable installation and with coupling foot for fixed installation of each pump. 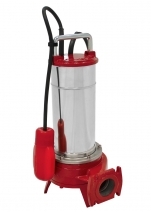 These series of grinder pumps are particularly used in civil and industrial sewage plants. They have been designed to pump the liquid at high head with very low capacity. The cutter unit, in a special hard stainless steel, cuts into small pieces threadlike materials contained in the liquids. As the risk of clogging is avoided small diameter pipes are used. 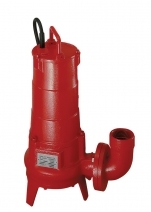 These pumps can be used to lift the sewage of blocks of flats and villas, small isolated areas far from the sewer systems; the sewage of hotels and campsites, in the food and paper industry and in those particular situations where the installation is often expensive by using a gravity system.